When we engage in some form of self-enquiry or meditation practice, insights and realisations can occur. I use the term “insights” to refer to finding individual pieces of the puzzle – insights typically show us how one aspect works or give us a partial glimpse into the workings of the whole. Realisations on the other hand tend to be more wide-ranging and give us the feeling that we can see how the whole puzzle fits together. Integrating such realisations into our daily lives provides not only a challenge but also an opportunity for growth. They can be challenging because, when we experience a realisation, we experience absolute knowing, without a shadow of a doubt, but when we attempt to communicate that realisation to others and translate it into a course of action, we can find that the knowing starts to fade and the previously invisible shadow of doubt begins to shroud the clarity of our perception. I can only speak from personal experience and suggest that others might also experience realisations in a similar way. What follows is a realisation which presented itself on the subject of realisations. Realisations come in a flash. They originate from the unseen, non-physical world, beyond the everyday mind of thought. Our first experience of a realisation is one of light or pure information. It is no wonder people describe realisations as “light bulb moments” because it often feels as though a light has been switched on inside the mind. This light enters the mental arena as a frequency or energetic encoding and gives rise to shape, colour, sound and word, depending on the condition and conditioning of the individual mind. A realisation, which is in essence pre-word and pre-verbal, becomes translated into conclusions according to the desires and fears of the individual mind. If we have a mind which is relatively free from desire and fear we will be able to translate the realisation more accurately into some form of written or verbal communication. If we have desires and fears, the conclusions we create in words will be informed by them. As the light of realisation enters the mind, a sense of clarity is formed which gives rise to a “Eureka moment”, a feeling-thought such as “Ah, now I get it. I can see it now. Now I know.” This in turn gets filtered through the individual mind of desire and fear and comes out as something like “Now I know what I need to do”. At the mental level a realisation is only as good as the ability of the individual mind to comprehend it. We could say that the realisation begins its journey in the mind of light and then travels into the conceptual mind, through the emotional mind and onwards into the mind of communication. At the level of the conceptual mind the form which the realisation is able to assume is reliant upon the concepts which are present within the mind. If a suitable concept does not exist within the conceptual mind, by the time it reaches the mind of communication, the realisation cannot be shared effectively with others through the medium of words. If we consider the many scientists and philosophers throughout history who have been “ahead of their time” we could say that these people had a conceptual understanding of a subject but were unable to convince other people who did not have the same level of conceptual conditioning in their minds. Looking back through history we can see that accepted worldviews tend to be based around the technologies and accomplishments of the day. In the age of clockwork mechanisms we tended to view the universe in terms of mechanical and clockwork processes. Now we live in a quantum age and our “understanding” of the universe has changed accordingly. These days we are able to discuss ideas about consciousness in terms of fields because we are all familiar with the concept of the field through knowledge of electromagnetic fields. But if someone had tried to talk about consciousness in terms of fields before the idea of fields was even thought of in scientific circles, his ideas would mostly have fallen on deaf ears. The presence of fear will also be a factor in preventing a realisation from being given a warm welcome. Realisations are great when they make us feel empowered, but if they bring up our suppressed fears we will most likely not want to know about them. Now let us consider what happens when a realisation comes from contact with a teacher or information in the form of a book. Knowledge is encoded within us, in an enfolded state, in the inner dimensions. What happens when we have contact with a teacher or a teaching is that the encoded knowledge becomes activated and starts to unfold which gives rise to a realisation. The realisation existed within us all along, but in an enfolded state, akin to being packed away in a box. Then we come into contact with someone or something (either in the outer world or the inner world) which carries a resonance capable of awakening our packed away or enfolded realisation into an unfolded or unpacked state. In a matter of seconds we have translated the flash of light into a concept and filtered it through our desires and fears to arrive at a conclusion. We then rush off to share our newfound realisation with someone else. Now if our realisation is met by confusion, lack of enthusiasm or disapproval, we can begin to feel deflated. What we do at this point will depend upon our conditioning. If we are prone to blame or anger we will lash out at the other person and conclude that they “don’t get it” and “don’t understand”. If we are prone to self-doubt and self-criticism we may begin to doubt the realisation and doubt our own ability to know anything. Each realisation requires a specific frequency or resonance to activate the relevant encoding. Similarly, doubt and confusion can be activated and perpetuated by the existence of frequencies or resonances which are discordant with or inharmonious to the frequencies and resonances of the realisation. Just as we saw that the presence of something or someone was enough to trigger a realisation, we can consider the possibility that the same process is occurring when we communicate our realisation to someone who does not share our enthusiasm: in other words they could be providing the frequency to activate the doubt within us which had previously existed in an enfolded state. In which case, regardless of our interactions with books or people in the outer world, the entire experience is a mirror for what is happening within us. The realisation was being activated within us and the ensuing doubt was also being awakened from within. No teacher or book can actually give you knowledge, wisdom or enlightenment – they can only provide a frequency which will enable a realisation of what you already know implicitly so that knowledge can awaken into an explicit state. The role of the teacher then becomes to hold the space for realisation to occur, to pacify the mind as it begins to react to it, and to encourage the individual to stay in the energy of the realisation instead of rushing to define it on the level of words. Forming conclusions is a tendency of the mind which seeks certainty as a means to perpetuate its own survival. The mind will want to form hasty conclusions because it dislikes doubt, confusion and not-knowing. But if we form a conclusion and a corresponding course of action based on a realisation which is filtered through desire or fear, what we end up with is acting out a situation based on that desire or fear. In the course of this “acting out” we will need to discern which aspects of the ensuing drama correspond to the original realisation and which relate to the fear or desire through which it was filtered. This has the inevitable effect of bringing the entire realisation down to the mental level of thinking in which it loses its original clarity and energy. If we consider any kind of teaching presented in words, we may conclude that it is the words themselves which bring about the realisation, but I would like to suggest that it is not the words themselves but the frequency they represent which allows our consciousness to expand. It is not the words but the energy they carry which helps to open up our innate wisdom. Furthermore, it is not simply the energy of the words themselves, but the energy imparted by the person speaking or writing the words which is having an effect, for anyone who chooses to communicate any kind of teaching through words is sharing an aspect of his own consciousness through those words. Anyone who has the kind of experience of realisation I described earlier will know how easy it is to go from the absolute knowing of realisation to the relative doubt experienced when trying to communicate that realisation, translate it into a course of action and integrate it into his life. But realisation does not demand that we give it form through a physical medium. We could simply choose to remain in the presence of that realisation and allow it to emanate from us silently. We could integrate it into our presence without overtly advertising it. If we do feel drawn to communicate a realisation we could even ask ourselves what is prompting us to do so – is it to share with someone so that he might also be uplifted, is it to help alleviate suffering, or is it because we are trying to prove something to someone or show how clever we are? Are we sharing for the greater good or just to make ourselves feel better? As a realisation temporarily lifts us out of relative confusion, the tendency will be to react to it like a dog chasing a ball. We will want to run around with it and have some fun. But when the realisation fades and we return to a state of exhausted confusion we could ask ourselves whether it might be better to remain as we were and wait to see what might exist beyond the experience of realisation. We could say that realisations are expansions of consciousness as we step out from a relative state of ignorance into a relative state of enlightenment, with this new state of enlightenment, in time, becoming the new state of relative ignorance and limitation. In this way we can see each realisation as a single step in the journey towards ever greater freedom. If we stop at a realisation and base our life’s work around it, we can celebrate the fact that we have symbolically found a key to open a door. If we set out to find one key to open one door then this is fine, but if our goal is true spiritual freedom, we will be searching for the key which opens all doors, in which case the sooner we integrate the realisation and move on the better. Personally I see realisations as gifts – I not only feel a duty to give them form but I feel a natural urge to do so. 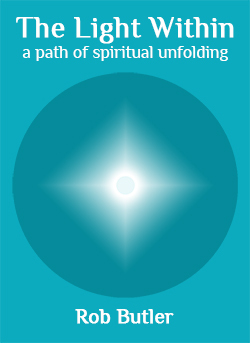 It is often only through the process of communicating a realisation through words that I am able to gain a deeper understanding of it and fully integrate it into my life. But rather than choosing to create a fanfare about it, having given form to the realisation, I opt to focus on integrating the energy of that realisation into my presence. We may feel uplifted by a realisation and want to share it with others, perhaps in the belief that it will enlighten them, but we do not change people’s minds through persuasion or discourse: people change their own minds when they are ready and our offerings, verbal or non-verbal, written or unwritten, will either help of hinder that process. When we successfully integrate a realisation into our being, our very presence will suffice to help someone to rise up out of confusion if they are ready to do so. Sometimes we may offer a few words here and there but these are simply minor accompaniments to the silent sharing of wisdom, mere validations for the mind which seeks to be comforted and reassured. What I have written thus far about realisations came into my conscious awareness in the manner I have described. It arrived as a flash of knowing, like a zipped folder of files, waiting to be unpacked. As I sat with pen and paper the knowing unfurled into words which formed sentences. When this happens I am scarcely aware of what I will write before it is written. As I write I can feel if a word has the wrong resonance because it “feels wrong”. Equally, sometimes I need to wait for the right word to present itself. Having engaged with this process of translating realisations into the form of sentences for some time makes it easier to tell when my individual mind wants to take over and direct the flow of the writing. At these times I have to step back – sometimes deleting the last few words or sentence – and wait for the original flow to return. I am aware when I write that I am adding flavours from my own mind, for example my personal dislike of jumping to conclusions and my wariness of becoming deluded, but by and large it feels as though the realisation is being presented as close to its original form as I can make it. Inevitably the realisation will be picking up elements from my subconscious mind, of which I am not aware, but these too tend to come to light over time during subsequent editing and proofreading exercises. Although I had recently contemplated aspects of what I have written above – and the awareness of how realisations come in a flash and then get filtered through our minds was presented to me nearly 4 years ago – the realisation about realisations which came this morning arrived as an overall package. Or at least that’s how it seemed. Maybe I had been collecting data for some time and this morning’s realisation came from “downloading” the final missing piece of information required to complete the picture. Sometimes it seems as though realisations come on the back of growing suspicions about something whereas at other times it seems as though the entire realisation has come out of the blue in an instant.